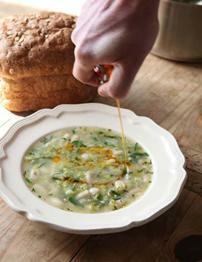 The chilli oil gives this soup a deliciously piquant finish. Once made, the oil will keep, sealed in an airtight container in the fridge, for a couple of weeks, and you can use it to add a bit of heat to marinades and salad dressings or to trickle over pizzas. However, if you don't have time to make it, you can simply trickle a little extra virgin olive oil over the soup and finish with some shavings of Parmesan, pecorino or hard goat's cheese. First, make the chilli oil. Put the chillies in a small saucepan with the olive oil, thyme leaves and unpeeled garlic clove. Heat slowly until the oil is simmering very, very gently and cook the chillies until soft, about 20 minutes. Remove from the heat and cool. For the soup, halve the leeks lengthways, wash well and slice thinly. Heat the olive oil and butter in a saucepan over a medium-low heat. Add the leeks, with the thyme and bay leaf, and sweat gently, stirring from time to time, for about 15 minutes, until very soft. Add the garlic and stir for a minute. Add the stock and cannellini beans, the oregano and half the parsley. Season with salt and plenty of pepper, increase the heat and bring to a simmer. Cook gently for 20 minutes. Remove the bay leaf, taste and adjust the seasoning if necessary and stir in the rest of the parsley. Serve in warmed bowls with a trickle of chilli oil over the top.